Well participating via Google+ is also an option so that shows just how important we are to the city. I've always wondered how much people who are actually involved in planning as their profession at the local, regional, and state level are aware of/participate in this forum. They're aware and they lurk. Not that we're actually changing anything. They just take the temperature of the nerds and chuckle most likely. If we actually want to push for changes that we blather on about on here we'd need to actually start participating in the public process (as I know plenty of people here already do). I can confirm the MAPC people check-in here. I've been to plenty of public meetings. Public meetings are often mostly pageantry around predetermined outcomes and very poor format for conveying ideas at any satisfying level of detail. More political in the sense of being a physical presence or a headcount when there is a clear issue on the table. But if people care about a healthy public discourse they will seek it out and not sit back in a hearing. I highly encourage people to attend a few public meetings, just a few. 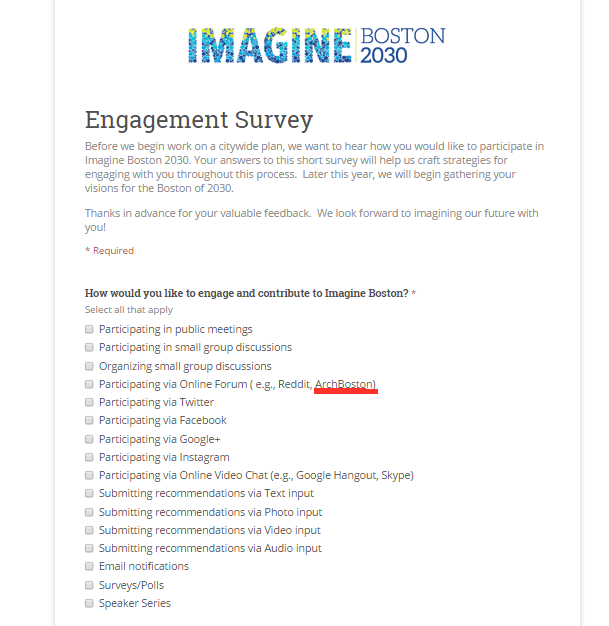 Mayor Walsh announced today that the community engagement process for Imagine Boston 2030 has officially begun with the launch of the Textizen mobile platform. The Mayor has challenged those who live, work and play in our city to embrace creative public engagement strategies that go beyond traditional community meetings as part of this process. This text message survey tool is just one of the many innovative ways that we are reaching constituents. Sorry to bump, but I think the choices they listed are topics for good debate here. 1. C: Better transportation options. hopefully this means expanded/denser bike share and improved bus service where the city can intervene. I'd love for it to mean better rail transit, but it's hard to imagine the city having much of an ability to do anything about that. 2. E: A more environmentally-friendly city. I imagine this being similar to what I wrote for C, with the possible, hopeful addition of things like incentivized solar installation on homes, expanded bike parking, congestion pricing, neighborhood parking fees, and expanded and more efficient recycling programs. 3. I: More vibrant neighborhoods. I hope this means added density where there is demand, near transit, and along commercial corridors with single-story taxpayers. I also hope this means expanded liquor licenses and things of that sort. 4. D: Quality education for all. Oh yeah. With smart investments in BPS, the school system can improve. With an improved school system, families would slow the rate of movement to the suburbs when their kids reach school age. This would be great for the city. 5. A: Housing I can afford. I shy away from ranking this so highly as I know the city has it wrong. Ideally, this would be my #1 selection if I believed the city wanted to remove barriers to development, and even incentivize development in the highest-demand parts of the city, thus addressing our housing shortage and slowing the increase in market-rate pricing for housing. Sadly, I fear the city may actually continue to legislate the market (out of existence) by demanding that developers subsidize more housing on their dime, further disentivizing development, and making housing LESS affordable, by exacerbating the shortage of supply. If that's the case, then bump this one to the absolute bottom of my list. For now, I'll keep it around the middle of my ranking, and remain foolishly hopeful. 6. B: Safer neighborhoods. This is great, but I don't rank it as highly because I don't know if there is much that the city itself can do. Obviously, smart investments in police are a good idea. Crime is too often demographic and economically related, and not really something the city can do a TON about. Although, they definitely can help make some neighborhoods safer. 7. F: Great parks and public spaces. If this means improving our existing parks and public spaces, as well as improving our network (i.e. gaps in the Emerald Necklace, extending Esplanade into Allston), then you can bump this up a couple spots. If this is really what I fear it is: "you can't have too many parks! There's an unused parcel where residential demand is high. Well, I hate change and development, and parks are nice. Let's put a useless park there!" then you can drop this to the bottom. 8. G: A more innovative and creative city. This kind of seems like a bunch of corporate-mumbo-jumbo and I'm not entirely sure what they mean with these catch words. But, if they mean applying smart, technological solutions to public, city issues, then you can bump this up a couple spots. Such as, smart parking-meters like in Somerville or even incentivize the development of incubator spaces. If they are just using catch words with no substance ("oh hey! creativity! innovation! "), then you can drop this to the bottom. 9. H: Expanded job opportunities. Sounds great. Not the city's job. Incentivize development, both housing and commercial, and decrease tax burdens on companies who hire local employees.. That's about all the city can do. I agree with you on almost all parts; I just had better parks higher in the list. *Not much the city can directly do* Cities always talk about how their permitting and licensing for new businesses is a long process that sometimes hinders both small and large companies from moving into their city. It would take a lot of work to do so, but I recall somebody saying that Boston 2030 was intending on simplifying and speeding up the process to get more companies and, thus, job opportunities to the city. On another note, we can almost guarantee that this survey will be answered with predominantly affordable housing, better education, and better parks. I say that because every Bostonian that opposed the olympics, and 90% of commenters on the Boston globe, said/say "cheaper housing, better schools, build parks, don't destroy them" and this is another "opportunity" for their voices to be heard by the city. Great to hear about the licensing process is being addressed. That is encouraging and I will bump it up on my mental list. I guess I need to go out there and get my voice heard, as well as returning the survey, so our housing development isn't stalled in the name of subsidies and parks. Safe and separated Bike network (combined with BRT) is by far the biggest bang for buck and would make the most lasting impact. A lot of the other topics will fall into place once we get over this hurdle. If we can feasibly build very low-car housing in the city based on the strength of the bike network this would go a very long way to reducing costs. 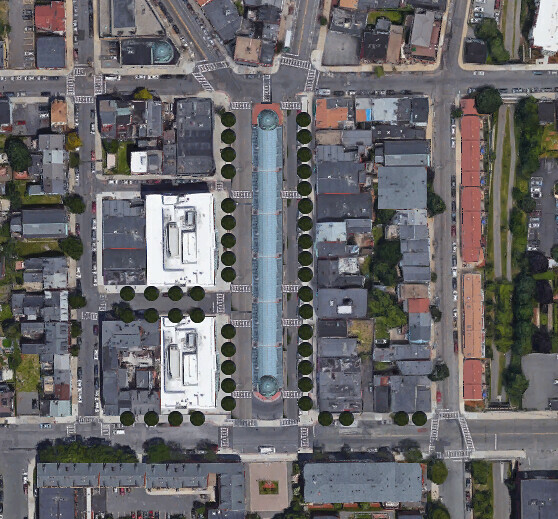 I want to see a reimagined Maverick Square, so I whipped up a Before & After of how that might look and shared on Facebook with Imagine Boston 2030 & the East Boston Open Discussion Group. Thoughts? Nice, I really like the idea. 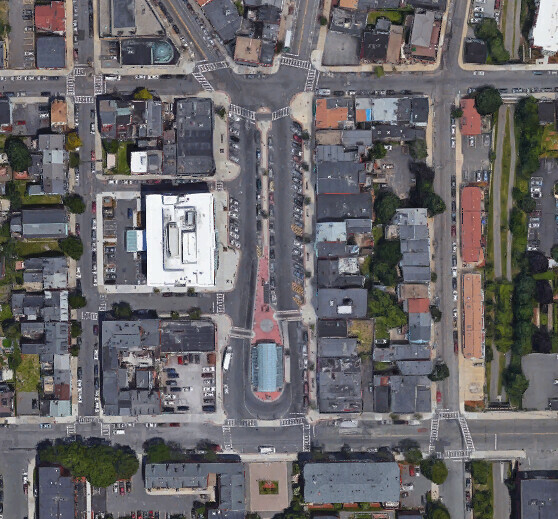 Especially for this location, it is the gateway to Eastie from the city. You'll find a lot of push-back on removing the parking (unless you were planning on linear curb parking). I personally think it would be just fine with a taxi stand, pick-up/drop-off zones, and delivery zones. Curb parking needs to go just about everywhere. This would really be an awesome spot for a porous market, though, and such high foot traffic with all the buses, the Blue Line, and people making that transfer, too. I'd like to see this pursued and see more detail in regards to the curbing -- this has big potential. The first thing I thought of when I saw dshoot88's post is the Charleston City Market. If they could manage to keep the flavor of it unique to the neighborhood (as opposed to the more upscale Boston Public Market), that would be even better. It's a great suggestion. THANK YOU so much for posting that... that's literally exactly what I have in mind, except maybe more glass than brick... like you said, keep the flavor unique to the neighborhood. The Fells Point Market in Baltimore is sort of similar as well, although in a pretty ritzy neighborhood. Note for people checking out the link: Google did a nearly complete indoor walkthrough of the whole market! Turn that surface lot at the corner of Sumner and Maverick into a garage with ground level retail and you can replace the displaced on street parking. Otherwise wait ten years and you have autonomous cars dropping people off and picking them up and car storage can go elsewhere.